You are here: Virgin Islands News Online » News » BVI Airways & Gov’t @ war! Is it a shake down? BVI Airways & Gov’t @ war! Is it a shake down? ROAD TOWN, Tortola, VI- After the Dr The Honourable D. Orlando Smith's Administration was embarrassed that after announcing some four dates for BVI Airways to fly between Miami and Beef Island and none coming to pass, the situation is getting ugly. Dr Smith bailed out the bankrupt BVI Airways with tax payers funds of some $7.2M and even violated the agreement after the money was to be paid out over three years but the full amount was advanced within six months. It was last month that Miami International Airport announced that flights will commence on July 22, 2017 with BVI Airways between Beef Island and Miami, Florida. However, BVI Airways said 'not so fast' and accused the Miami Airport of jumping the gun. 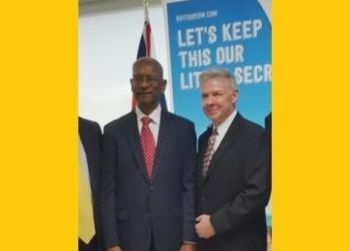 In fact BVI Airways said its date of take off between Miami and Terrance B. Lettsome International Airport will be announced by them and that there are still outstanding matters between the Virgin Islands Government and the Airline. It did not disclose what the outstanding matters are; however, a senior National Democratic Party source told our newsroom, "they came and needed more funds and the answer was no, so I can't tell if that is the issue." It is unclear how much more funds they were allegedly requesting and why it was reportedly rejected. However, Premier Smith in a statement late last night, July 4, 2017, called on BVI Airways to start the Miami-Beef Island flights without any further delay as his regime “has fully discharged its responsibility to BVI Airways by providing $7 million as a subsidy in keeping with the terms of the agreement." Our newsroom is investigation the details of the standoff, because it must be noted that how the agreement is structured, if BVI Airways never flies the tax payers will not get back a dime of its $7.2 M (USD) pumped into the privately own business. BVI Airways pulled out of the Territory in 2014 claiming they were bankrupt, owing the BVI Airports Authority close to $100,000. If we intend for this to be bloodless, the governor must still be part of the equation. @ wize up, well in this case I believe he has put his foot up his own @&& and maybe sh*tting on himself all now. On another note the word is, "HAUL" and not, "HALLED". Teeth and tongue fall out now. the BVI airways investors will clearly have their cake and eat it too. and all sorts of overpaid consultants, but nothing as common as common sense. We in bales ah trouble around here. When will they ever learn? 86x$550(estimate ticket price)=$47300 x2(Sat&sun flights)= $94600. x4(weeks in the month)=$3,78400. x12(1 year)=$45,40800. 45,00000- landing and other fees to operate the airline will still make us happy at the end of the day. How much to rent a yacht from moorings $9000.plus for 7nights. How much money coming in from Fees? Hotels will see more overnight guests. More passengers will fly into Miami, using Virgin and British Airways than flights to Antigua. Your use of number separators is confusing. Let's clarify: 86 x $ 550 yields gross revenue per flight or $ 47,300. If there are two flights (Sat and Sun) per week, then weekly gross revenue is $ 94,600. But these flights also return to MIA each of those days, so with sale land factor, gross revenue is $ 197,200. There are 52 weeks in the year which would yield a total gross revenue of $10.254 million but demand would be lower at certain times of year (e.g. Aug-Oct), so if one assumes conservatively 65% average lad factor, gross annual revenue would be about $ 6.665 million per year. Sounds good but all that would be offset by aircraft operation costs (fuel, maintenance, landing fees, repairs), aircraft leasing costs, and business operations costs such as staff salaries, taxes, advertising, reservations etc). BTW your suggested fare of $ 550 while attractive seems unrealistic for a roundtrip. To that please remember there will be taxes, and departure tax, which are likely to exceed $ 350, which is about what it would cost to go to St. Thomas by ferry and stay overnight to fly to MIA. I've flow to MIA for as little as $ 280 round trip and up to about $ 650. The question will remain whether the extra cost of flying directly to or from MIA will be worth it to enough customers. Airlines operate on thin fickle margins, so not a lot of room for error or time to get it right. Seems like you and I are the only ones on here with some background in running an airline or having an occupation in the industry. You are very close my friend with the exception of the load factor. I would see it around 50-55% as the low season would be very low indeed. I have had many flights coming in to the BVI where there was only one passenger on board! Other than that your math is spot on! Well done Sir or Madam. From stt you can fly directly to ny, boston, atlanta, charlotte, or newark. The need to stop in miami is reduced to 1/5, so they will not get the estimated flights mentioned above. Is this a bad omen? BVI Airways is pointing fingers at government and government is pointing fingers at BVI Airways, the defunct airline that it give $7.3M of taxpayers’ money to start direct flights between Miami and TBL. And the finger pointing is occurring in public. Wow! Who should BVI residents believe? Residents need the facts on the hold up. Is a shake down for additional capital/cash/moola in the offing? Has the agreement gone off the rails? 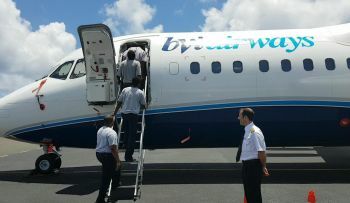 Did BVI Airways go public to embarrass government, given that it got us over the proverbial barrel? Did taxpayers get robbed in plain daylight with their eyes wide open? Will taxpayers ever get value for money? Could a local have gotten such a sweet deal? One is born everyday----sucker. Are taxpayers getting screwed without lubri.....t? Was the giveaway a unanimous decision by the NDP caucus? When will the Premier face the nation? Ting te tark! NDP supporters must be living on eggshells. tis man think he making directives to j.cline; tis is a whole nother ball game he playing now. Cline is spiritual, so he stepped aside, bou dey are not, so if tis ting isn't woked-out somehow, there goes another multimillion dollars lawsuit coming on. Wa else did you promise dem premier? Boy premier you and your team let me down big times; please don't look for my vote coming next election. Looks like the war between BVI Airways vs. NDP Government will be fully digitized. Stay Tune! This startup airline turning out to be more and more like a GOFUNDME operation. I tell you...only in WEE BEE WEE EYE. "Everyday the bucket a-go a well, one day the bottom a-go drop-out." It is a shake down. Why is it that their rich friend, who owns an airline, never has any input on this topic? One would think this is his specialty. This is what happens when the premier feels he can do what he likes with taxpayers money without informing us. The time for the Freedom of Imformation Act is long overdue. That is why we are in the mess. If this plane is not going to fly so we can get our money , every penny should be given back now. That agreement should have never been made. Just think is a local owes government money will they loan us more? The first thing they will try to do is get us to Balsam Ghut. The premier fought VI Airlink for those people. Tell us if locals have shares in the deal. BVI Airways did not take the money and run, they were handed the money by our elected officials...they then they ran. This airline will never make it. The government should have paid an existing airline (Delta, American, United, etc.) an annual subsidy to fly two days a week to Beef Island. They would have done it. I hate to say it but I told you so! I knew from the word GO that something was not right here. I was willing to bet dollars to donuts that this was all a scam and it looks like I was right on the money. If you follow the trail of aircraft registrations, lease and sub lease agreements and the routes the aircraft are flying now I have a good idea of what was going on but if I say what I think I will probably get served with a lawsuit! We, the taxpayer may as well wave goodbye to that money as this airline will NEVER fly as promised. You got what you votes for . Great conteact for thieves ! Did someone say shake down? I'm good for that! You guys should of try work with VI-Airlink. Guess they had the wrong color skin. Like someone said, never trust the w..... man.....They come with a smile and leave with your money and land... It's starting to seem like maybe we should have invested in VI Airlink for real. So tell me this, there are airplanes with the logo BVI Airways flying throughout the Caribbean except the BVI??? Imagine how dunce we look to the other Caribbean countries. Smh in shame. Time for Dr. Smith to go. He remains an embarrassment and a danger.